Brussels, 2 April 2008 — ISO members failed to disapprove the Open XML format. Microsoft has compromised the International Standards Organisation (ISO) during the rush to get a stamp for their Office OpenXML (OOXML), using unfair practices such as committee stuffing in several countries and political interventions of ministers in the standardization process. OOXML received 75 percent approval votes of p-members of JTC1, among them many nations of questionable expertise in standardization. In September a first attempt to approve the 6000 page standard Open XML failed with more than 3500 submitted comments. As in September many of the new approval votes were won by political high level intervention and the vendors dominance in national technical committees. Benjamin Henrion, initiator of the <NO>OOXML campaign, is furious about the tactics he followed over several months: "Committee stuffing is a standard practice for Microsoft. 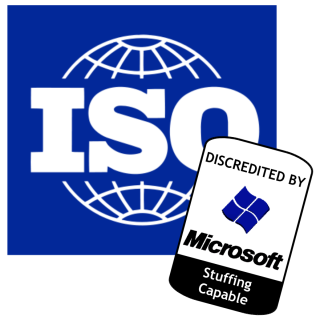 Microsoft raped ISO with their office file formats, leaving the organization in limbo. The whole campaign against the format have raised an army of people, which are furious about the dirty tactics used by Microsoft to get the broken standard through ISO. This anger won't go away, and I wish good luck to Microsoft to get it adopted by governments. The reputation of Microsoft went down below zero with this process." What is the definition of an "existing document"? Microsoft excludes competitors with OOXML patent license? Alex Brown has mud in the eyes? Does the OSP make OOXML an "open standard"? Microsoft, CompTIA, Novell, ECMA and others members of the "Ecosystem"
Microsoft hijacks now web standards and the W3C: -m$ fonts? » Sign the Hague Declaration! » Sign the petition Hague Declaration! "Scrap the Fast Track" or who is going to change the ISO FastTrack rules? SC34 meeting next week: yet another stuffed committee? DOCX the perfect vehicle for viruses? JTC1 directives to be rewritten by ECMA again? South Africa appeals against OOXML, call your Standards Body now! OOXML triggers demonstration in Norway: "Let's throw OOXML out of ISO"